I’ve been battening down the hatches here at the Mellowcat homestead, or “rally point” as the Resident Expert prefers. Why? It might rain. The last notable rain fell back in April, and it might rain again this week. I see that you are checking the calendar and are noting that it’s been six months since it rained. Well, that’s why they call it “sunny California”. Over the past several weeks I’ve been staining and sealing the new front fence, and then the back deck, so they should be well protected from the onslaught of precipitation. This was kind of a big deal; let me tell you why. 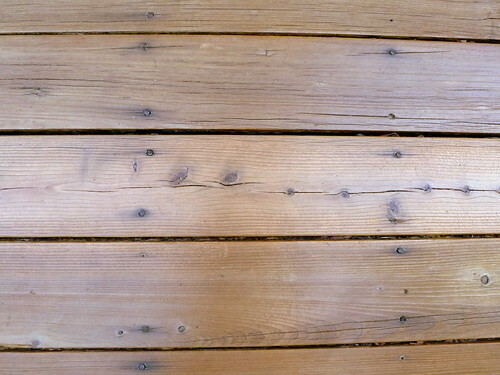 The fence and deck preparation used a ‘system’ of stain and sealer that basically doubled the effort. Everyone else would just prep the surfaces and apply some kind of protective finish. That’s not good enough for the Mellowcat. We need to find some new, untested, and expensive process that takes twice as long. Did it come out OK after all that? You be the judge. Before you say anything, let me state that this is the ‘after’ image of the deck. It was in really bad shape to begin with, so you’ll have to take my word for it – it looks much better now. Last year I paid a guy to refinish it, and he used a ‘green’ stain and sealer. I hope it was ‘green’, because it completely came off during the year and has long since filtered into San Francisco Bay. We shall see if this new system works any better. I also cleaned out the gutters (can we come up with a better name?) and will remove the deck furniture cushions if this week’s tentatively forecasted rain comes to fruition. I shall keep you posted. There’s nothing more interesting than someone else’s weather.